Tai Chi has unique effects of increasing “exercise for the body” and “focus for the mind.” Learning TaiChi can add enjoyment to people’s leisure time, while also helping to relieve stress and strengthen body. As a sport suitable for both young and old, TaiChi is becoming increasingly popular. The Music TaiChi Class was founded in 1997 by Master Yee-Tak Fung. Classes have been held every Saturday 12:00-3:00 pm in Tilden Middle School (Montgomery County, Maryland) for nearly 14 years. After passing away suddenly in 2004, Master Fung’s students have in turn taken over his classes. The Music TaiChi class is currently instructed by Dr. Phoenix Liu. The class focuses mainly on Yang Style TaiChi. Dr. Liu continues Master Fung’s philosophy of focusing on the training of fundamentals in her teaching. Practicing fundamentals strengthens physical conditions and stabilizes TaiChi stances–an indispensable method of developing the ability to quickly grasp forms. * 12:00 – 12:30: Focus is on warm-ups, stretching and Qigong, with additional imparting of meridian and health knowledge. The goal is for all parts of the body to be exercised. Warm-ups begin with the joints of the extremities, and then relaxing the meridian system of the entire body in succession. Stretching the legs is the final and most important part of warming up. Initially, stretching the legs may be boring or painful, but the student must persevere, slowly extending the ligaments to eventually attain the flexibility needed for form practice. After stretching and patting the legs, pat the meridians to loosen the hips and legs. Massage, rotate, and pat the knees for protection. Rotate, stretch and bend the waist for strengthening. As the old rhyme goes, “First in the legs we do age; And with difficult steps now a cane; Remember to walk 100 steps a day; Twist and stretch and healthy remain.” The goal of the first section of Music TaiChi Class is to use gymnastics’ movements to exercise the waist and legs. In martial philosophy, TaiChi movements are described: “roots are in the legs; legs initiate and lead the hip; form is found in the fingers.” Hence, in individual movement practice, other than emphasizing stances, steps and hand forms and movements, the most important is using the already relaxed hips to actualize the TaiChi movement. The hip is the axis by which the body twists up and down, closely affecting the four limbs. Hence we need to ponder how to most effectively use the power of the waist to shift weight and adjust the power of our push. Beginners often cannot understand that the circulation of TaiChi’s internal power is formed through the four limbs which are led by the rotating waist and spine. They often have the problem of “moving arms and legs without moving the hip.” This must be slowly comprehended and applied through individual practice. Hand forms include the fist, palm and hook. Hand methods include warding, deflecting, squeezing, pressing, plucking, elbowing and leaning. Stances include bow stance, empty stance, crouch stance, T-stance, rest stance and horse stance. Steps include forward, backward, following, retreating, forwarding and covering. Moves such as “part the wild horse’s mane,” “brush knee and twist step,” and “weaving lady works at shuttles” will all be individually explained, including the movement position and direction. Students should carefully grasp and self-examine whether the overall form is in proper position, whether weight is evenly distributed, whether upper and lower parts are coordinated, whether the head is pushing upwards with neck relaxed, whether all movements are smooth and continuous, etc. * 1:00 – 2:00: Practice Yang Style 24 movements and self-choreographed music TaiChi forms. After the movements that are broken down during the individual practice period are grasped to a point, the form will now be practiced in its entirety. Discerning the complicated relations between body movements is now the key. Following a certain movement pattern and the rhythm of the music, gradually comprehend the concepts as the feet lead the legs, the legs lead the waist, and the waist leads the hands in the form. TaiChi movements are slow, but the vitality should not lessen as a result. In fact, the exact opposite must occur. Vigor must be present. It’s not enough to simply stare the eyes forcefully. There must be an inner, controlled vitality. The presence of the music can help to energize and relax, but not deflate. While practicing form, mind, and relaxation, breathing must also be guided like the music. With the coordination of the opening and closing of physical movements, inhaling and exhaling of breath, rising and falling of Qi, and accumulation of energy, the state of using mind and not force, emphasizing internal and not external can be more easily achieved. • 2:00 – 3:00: Advanced class practice of Yang Style 48 movements, TaiChi Sword 42 movements and Chen Style 18 movements. With this in mind, we do not encourage Music TaiChi students to join the advanced class too early. Students of this class must have enough energy, strong fundamentals, and a deep enough understanding of the techniques of TaiChi. Basically, the philosophy of this class is that basic movements are the most fundamental of training foundations. Any music form begins with basics and advances step by step. The student practices movement by movement and gradually gains understanding. The process from beginner to advanced establishes a strong foundation to help prevent weak forms without substance. 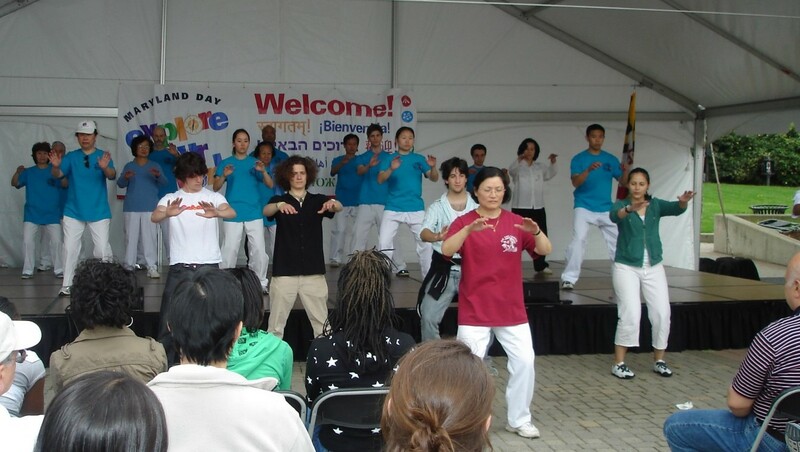 Every year, the Music TaiChi class performs in various local festivals. Each time, in the weeks leading up to a performance, classes become group training sessions. Students are usually all very excited and serious about participating. Many close friendships have been established through years of training together. The class has thus developed into a social supporting group. Practicing TaiChi requires a calm mind and spirit. Using thoughts to lead each movement leaves the practitioner in a focused yet relaxed state of mind. TaiChi also requires coordinated physical movements that go with the natural flow. Hence practicing TaiChi is also exercising the center of the meridian system, thereby strengthening one’s sense of balance. In 2007, Holland’s Zeeuwe BioMed Center published a medical research report proving that practicing TaiChi can reduce the probability of falling for senior citizens. TaiChi is a moderate, full-body athletic sport. The body and limbs are naturally stretched through practice. As muscles relax, blood vessels expand, promoting blood and lymph circulation. This then strengthens the functions of the internal organs and the immune system. In 2007, UCLA published a report in the Journal of the American Geriatrics Society, showing research indications that TaiChi is beneficial to the immune system of senior citizens. According to traditional Chinese medical theory, “Disease in any of the five internal organs is reflected in the 12 acupuncture points.” The 12 acupuncture points, including Taiyuan (太淵，lungs), Shenmen (神門，heart), Daling (大陵，pericardium), Taixi (太溪，kidney), Hegu (合谷，large intestine), Wangu (腕谷，small intestine), Yangchi (陽池，triple burner), etc., are all distributed along the wrists and ankles. Continuous movement of the wrists and ankles when practicing TaiChi is then equivalent to massaging the acupuncture points, which is a more or less beneficial disease prevention method for the internal organs. The Music TaiChi class is free and open to the public. Members need to pay only a minimum fee to share the rent. If interested in Music TaiChi, please contact Ms. Fung at 301-365-4622 or <hopecfung@yahoo.com>. Our hope is that TaiChi, as a “valuable remedy,” may benefit greater number of people! This entry was posted in Experience Exchange and tagged Music Taiji, Phoenix Liu. Bookmark the permalink.